Welcome to part two of our three-part series on school attendance area boundary reviews, where we’re taking a look at how school districts can successfully update boundaries with a consensus-based and data-driven approach. If you haven’t read our first post on setting a boundary review up for success with our geographic approach to student enrollment forecasting, you can read it here. Today’s post is all about the importance of building community consensus during a boundary review. Ask any school district leader who has gone through a boundary review, and you’ll learn that navigating the process can be tough. It is often emotional for families affected by new attendance areas, and districts can find themselves challenged to provide transparency to stakeholders. However, with our consensus-based approach, districts can mitigate most opportunities for tension between the district and the community. 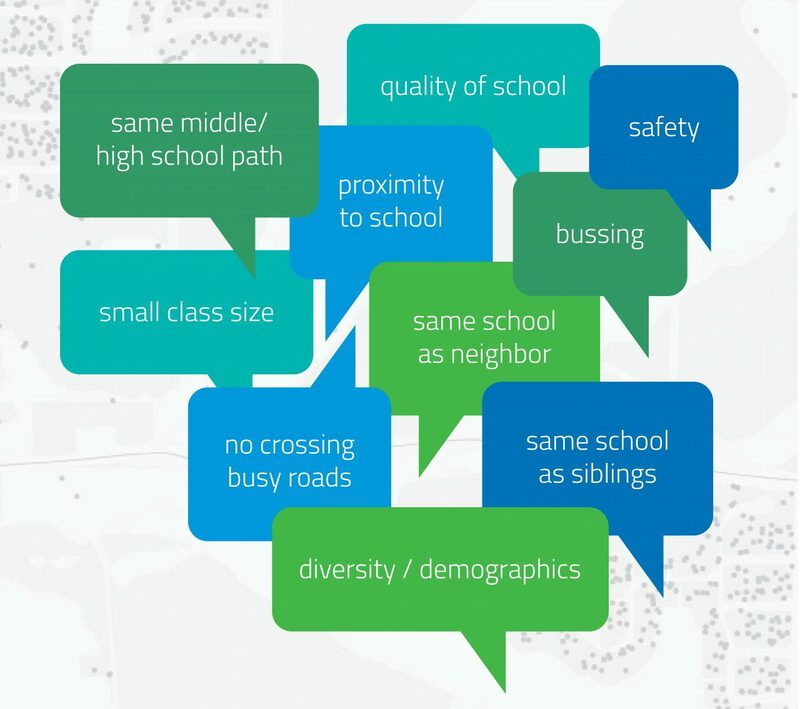 To engage the community, be transparent, and ensure buy-in throughout the boundary review, we work with districts to develop a plan of action to collect feedback on what the community feels is important when it comes to school district boundaries. Feedback can come in via open houses, stakeholder focus groups, or online surveys. Once responses are in, we analyze them for common themes and create a list of core community values. With the core values in hand, district leaders can start redrawing boundaries, balancing administrative requirements with the community’s needs. When a district provides the community with an opportunity to provide input, they’re building trust, and increasing the chance that new boundaries will be accepted without dissent once boundaries are finalized. In our next and final post, we’ll explore how interactive maps and technological tools provide transparency for stakeholders, and help the community efficiently redraw new school district boundaries. Questions about community consensus building and school boundary reviews? Click here to get in touch, or download our boundary updates brochure to learn more.